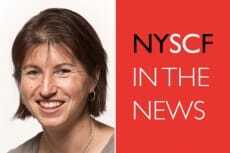 NYSCF – Robertson Stem Cell Investigator Dr. Kristen Brennand, of the Icahn School of Medicine at Mount Sinai, published her latest work on the physical differences between different lines of induced pluripotent stem (iPS) cells made from patients with schizophrenia. Her results demonstrated that human iPS cells resemble fetal brain tissue and, therefore, are an ideal model for investigating disease predisposition. NYSCF is collaborating with Dr. Brennand on using iPS cells to research schizophrenia and other mental illness.